Well Worn makes sustainable theatre in sustainable ways. We are a 10 year old Johannesburg based company, established in 2008, that uses performance and play as an activist tool in order to radically examine, interpret and discuss the most pressing eco-social themes of our time. We believe good stories, well told are able to create the space and conditions necessary for critical thinking and open dialogue, providing information and the empathetic response needed to inspire transformation, big and small, inside and out. Well Worn strives always for originality and theatrical excellence, as a means for crafting a poetic and meaningful connection between audience, subject matter and play. We are a well-respected devising and physical theatre company committed to acting imaginatively and wholeheartedly to address and reflect on issues of eco-socialism, climate justice and Earth-consciousness. Well Worn Theatre company comprises of several young artists and is headed up by artistic director, Kyla Davis, a highly trained performer and director who specialised at The School of Physical Theatre in London. Well Worn aims to be a mouthpiece that translates complex social and ecological issues into accessible, visually arresting performances that are also able to engage a diverse and young audience. We want to grow a socially and ecologically conscious new generation through theatre. Splash and splutter…then shhhhhh…only ripples left…Who will dive in next? Well Worn’s latest physical theatre production for young audiences,´Galela’ is a thirst-quenching tale of a small community deeply affected by our country’s water issues. Three best friends embark on the brave task of making their town´s water safe to drink again. They soon discover however, that the problems affecting the dam are deeper and more complicated than they first thought. Still determined to try and make a difference and to secure the future of their friends and family, the trio prove in spectacular fashion that children with the biggest imagination will save the world. To whet your appetite for fresh youth theatre while learning more about drought, water pollution and other water issues currently affecting South Africa, please e-mail: wellworntheatre@gmail.com or call/sms 0818933633 to book a performance. Catch ‘Galela’ in the second half of 2018 when will be visiting schools theatres, festivals and environmental events across the country. Call us today to book a performance. ‘Rat Race’ is a pop-up storybook play for the very young about an unlikely friendship between stressed-out city rat Miles and kind, easy-going farm mouse Melissa. It’s a comic play with a gentle eco theme that uses live music, clowning, puppetry, illustrations and physical theatre to tell a colourful ‘tail’ about Big Changes in Little Lives. The story follows Miles the rat who is a Big Cheese in the Big City, but when his hectic lifestyle starts to make him ill, he is ordered (by his mother!) to go on holiday to the countryside and relax. There he meets Melissa, a simple-living Earth mouse who loves the peace and tranquillity of her farm life. Miles and Melissa get off to a bad start when their worlds collide and they discover that they have very different daily routines. Miles thinks Melissa is too bossy and Melissa thinks Miles is too loud. Things change however, and so do rodents. Melissa helps Miles learn how to control his temper, relax and find peace in the little things like gardening and a good night’s sleep. Miles teaches Melissa how to really dance! After his holiday, Miles returns to the Big Smoke a changed rat, with tools to help him cope with his busy city life. Directed by Kyla Davis with an ingenious turning set by Christelle Van Graan, ‘Rat Race’ is performed by Ameera Patel and Roberto Pombo. The play was created in partnership with ASSITEJ SA and made specifically for ages 4-6 but is totally suitable for the whole family to enjoy :) ‘Rat Race’ received a Standard Bank Ovation Award at the 2016 National Arts Festival. These 1 to 3 hour workshops teach the essential principles and foundations of Physical Theatre including physical warm ups, technique, improvisation games and exercises, storytelling, mime, character building, stage combat, acrobatics, choreography and ensemble work. The workshop can be adapted to suit grades 6 to 12. ‘Making the Invisible Visible’: This 1 to 3 hour workshop leads participants through an intensive work-shopping process, beginning from a single source of inspiration such as a picture or a poem, in which they learn the fundamentals of playmaking. The workshop can be adapted to suit grades 6 to 12. 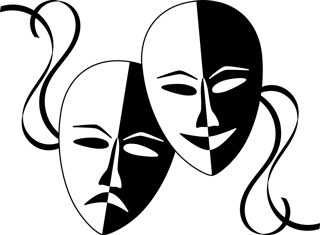 A fun, 1 hour workshop filled with drama games and Theatresports designed to engage learners and beginners in the joys and challenges of performing. The workshop can be adapted to suit grades 6 to 12. This 1 hour workshop highlights and elaborates on the important principles needed when making ‘theatre with a message’ with specific reference to Well Worn’s body of work and other examples of Forum Theatre and Theatre of the Oppressed. Suitable for grades 10 to 12. Ideally this workshop should take place over 2 days but can be adapted for shorter periods of time if necessary. This 2 full day workshop will lead participants through a mask-making process (learners will keep their mask following the workshop) as well as allow learners to explore and understand the techniques of mask play and performance. Suitable for grades 9 to 12.